“360 ARP” main activity (Ryazan) — repair of Tu-22? ?, Tu-95? ?, IL-76 and modifications, IL-78 (?). The plant is engaged in maintenance, technical condition examination, aviation equipment painting and also verification and checkout equipment and combined-arms measurement equipment testing. Average staff employed — 1217 people, revenue as of the end of the financial year 2017 — 2 305 418 thousand rubles. Incorporation of “360 ARP” in management sphere enables “Tupolev” PJSC production facilities development and delegation to Ryazan part of works on repair and modernization of strategic and long-range aviation aircraft. “Tupolev” PJSC is becoming a leading company of the strategic and long-range aviation division formed by “UAC” PJSC that is going to consolidate other assets. 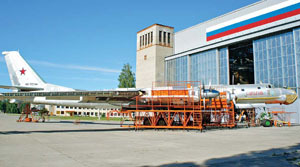 Alexander Konyukhov, “Tupolev” PJSC general director: - “360 ARP” – is a modern aviation repair production with good prospective and highly qualified personnel. Within the new structure the plant will continuingly develop its core competences - maintenance, repair and upgrading of aircraft Tu-95?? and Tu-22?3. We already have collaborative experience on these projects.